DRAPES is a local jewelry line I discovered two years ago at Wicker Park's Black Market Caviar. 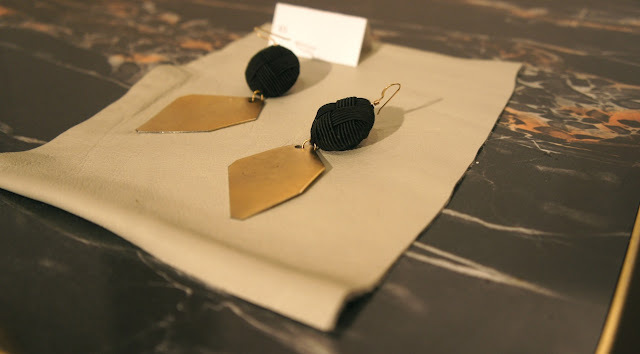 I was at the boutique for a t-shirt launch but was simultaneously sidetracked by the beautifully crafted fringe jewelry in front of the store. 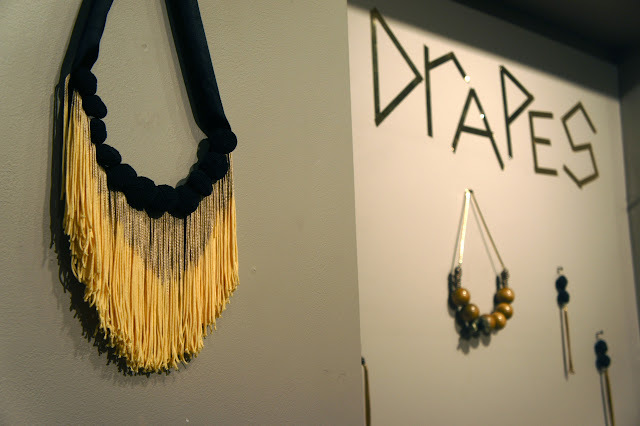 Once I was informed of the designer's name, DRAPES by Ashley Scott, I made a vow to own at least one piece of jewelry by the end of the year. Fast forward to today, and I own two pairs of earrings and a brooch! 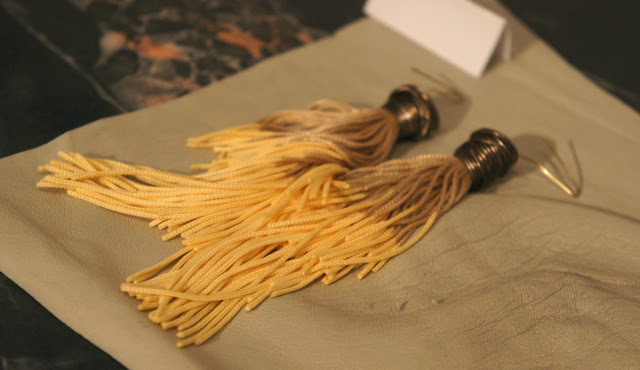 I have kept track of every DRAPES collection since that day in 2010. So, when I was recently invited to the trunk show for the latest installment, The Valiant Life, I knew I couldn't miss it. With fringe at the center of every past collection, I assumed there would be a few tassel items included. This time around, however, Ashley dabbles in the art of ombre. The dark to light color transition in the fringe necklace (above) and earrings (below) distinguishes these pieces from those of prior collections and proves that DRAPES knows how to maintain its signature design while also embracing current trends. I was most excited by the metal work Ashley added to this collection. 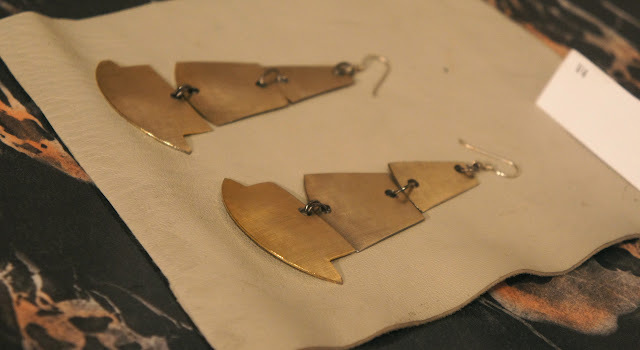 With each piece hand cut by the designer herself, no two items are alike, even within the same pair of earrings. It is this kind of asymmetry that ensures customers will truly receive a one-of-a-kind treasure. The 3-tier, all metal pair of earrings (listed on the website simply as V4) are my personal favorites within The Valiant Life family of jewels. The design is sophisticated and perfect for a dinner date or a night out with friends. Priced under $50, it's pretty much a given that they will be in my possession within the coming days. 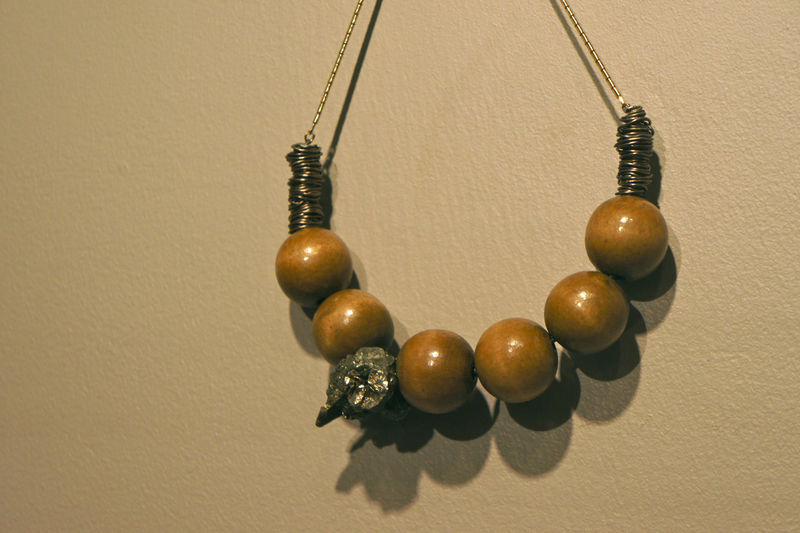 The collection's statement necklace, which incorporates beads, stones and wire, is quite the stunner. The versatility of this mixed media adornment, with its the neutral color scheme, allows it to be worn all summer long with a multitude of outfits. To view the entire Valiant Life collection* and start adding items to your virtual shopping cart, visit the DRAPES online shop. Once there, make sure you keep scrolling down to see some of the key items, from previous collections, that are still available for purchase. Go ahead, get "draped"! Then come back and tell me which item(s) had you clicking "Buy Now" in an instant. 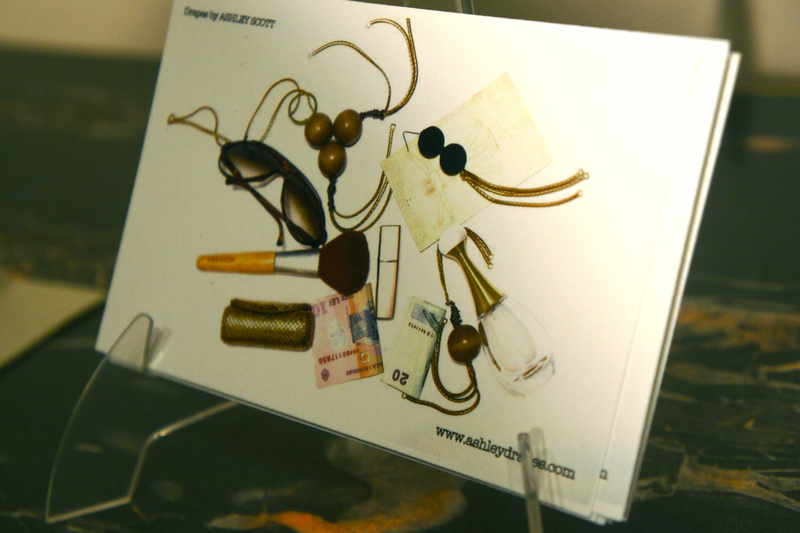 *The Valiant Life collection is noted as items V1 to V7 in the online shop. DailyCandy and Suave Professionals® joined forces to bring “The Style Suite,” a FREE VIP beauty and style lounge, to Chicago’s own fashion stars. 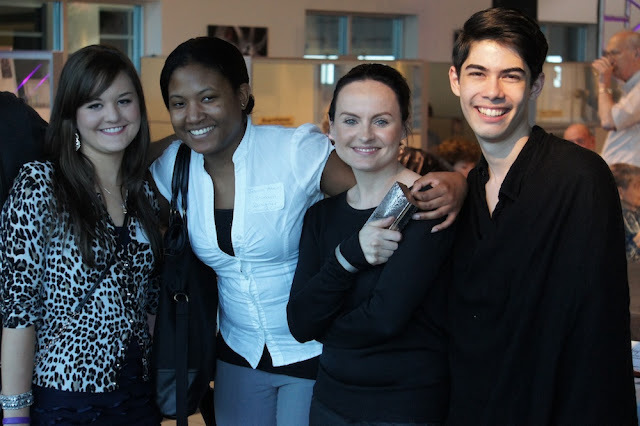 The exclusive event featured hair styling with Suave Professionals® Keratin Infusion™ products. The city’s fashion set mixed and mingled over sweets and sips while enjoying a private viewing of NBC’s Fashion Star, along with two of my favorite Fashion Star designers, Orly Shani and Nzimiro Oputa. Sidenote: I’ve used Suave products for years! I grew up washing my hair with Suave shampoo, and I still use Suave’s Cocoa & Shea Butter Body Wash. Suave’s commitment to offering professional-quality products and affordable prices has helped the brand remain a force in body care for over 70 years. The products often work as well as, if not better than, high-end salon and specialty brands. While I love Suave’s products, what I love most about the company is that it’s based in my hometown, Chicago. In case you've been living under a rock and have completely missed Fashion Star, NBC’s new reality fashion competition series, let me give you the quick run down. Fashion luminaries and buyers from the nation’s top retailers, Macy’s, H&M and Saks Fifth Avenue, decide the fate of 14 contestant’s designer brands. The host and fashion mentors of the show are some of the most iconic fashion figures of our time, including Elle Macpherson, Jessica Simpson, Nichole Richie and John Varvartos. International Business Times has called Fashion Star "one of the biggest and most-commercially backed reality competitions yet." Each week, contestants are given the opportunity to be purchased by one of the three retailers. And at the show's conclusion, the winning contestant will be crowned the "Ultimate Fashion Star" and will receive $6 million in orders for capsule collections at all three stores. 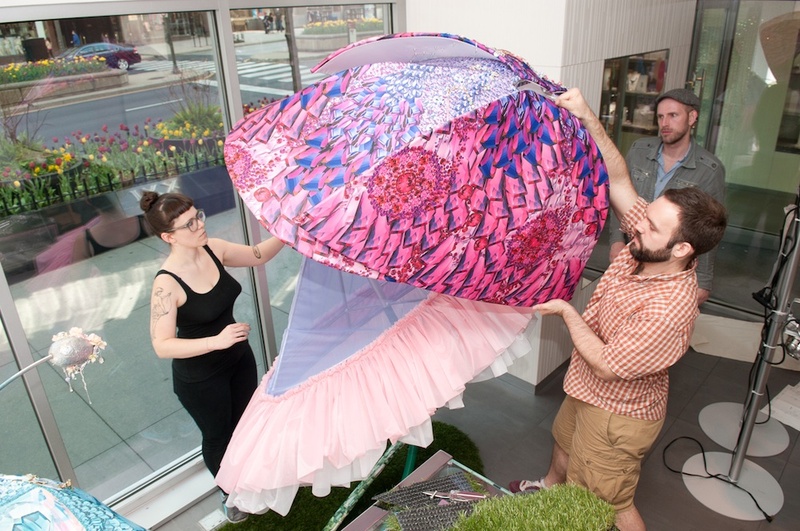 Tuesday night’s Style Suite took place at Hotel Palomar, in the city's River North community. While DailyCandy's goodies were a delight, the highlight of the night was getting face time with Fashion Star contestants Orly Shani and Nzimiro Oputa. In true Nzami-mi (as Nicole Richie would say) style, Nzimiro, a Detroit native who actually went to college for engineering, had lots to say! Orly and Nzimiro were very candid, mingling with guests like we were the Fashion Stars and they were the fans. However, I learned that viewers almost didn't get a chance to see Nzimiro's designs on the screen — he originally did not want to be on the show. For those of you outside of Chicago, there are still two more chances to experience the Style Suite and rub elbows with Fashion Stars. Get tickets to Miami's May 1st event or New York's May 15th event. Don't miss out! Who's your favorite Fashion Star this season? Celebrity stylist Brad Goreski first encountered fashion as a 12-year-old boy, captivated by the images in Vogue magazine. Since then, Goreski has emerged from his small town roots, breaking into the fashion industry as the style director of Rachel Zoe Inc. and transforming into a pop icon as a cast member of Bravo TV's The Rachel Zoe Project. Now, on the heels of the first season of his own reality show, It's a Brad Brad World, Brad has released his debut book, Born To Be Brad: My Life and Style, So Far. 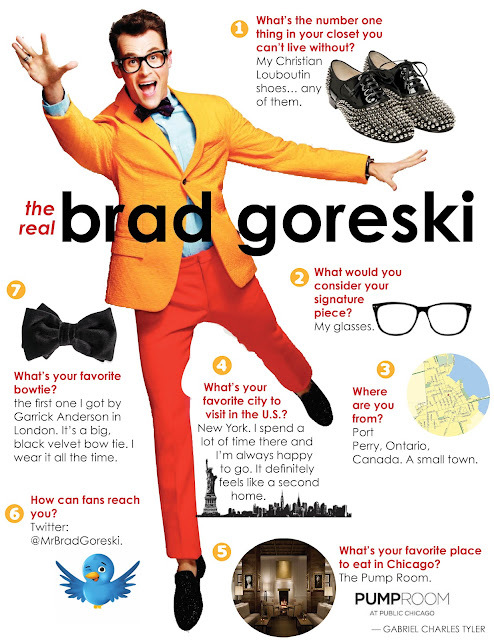 Saturday evening, Goreski partnered with Brooks Brothers for a signing of his book, Born to be Brad, which features the memoir of his humble beginnings, the story behind becoming Brad Goreski, tips to making it in the fashion industry and a style Bible. The evening was very Brad — guests were given Brad-esque cookies in the shape of bow ties and oversized glasses frames, while they waited in a line that swung onto the streets of Michigan Avenue to connect with the celebrity stylist. 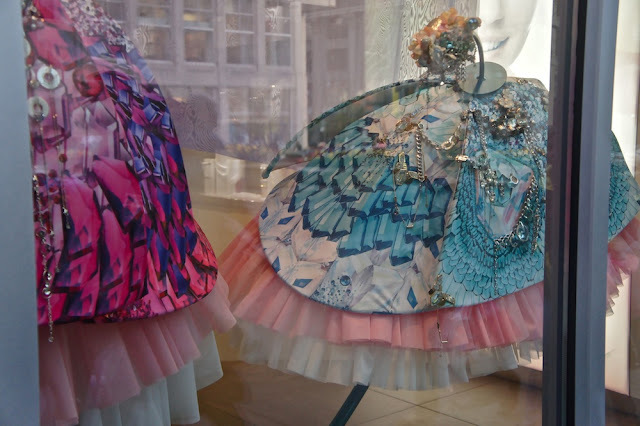 This week, Swarovski let the students of the School of the Art Institute of Chicago (SAIC) take full control of the window display at their flagship on the Magnificent Mile. 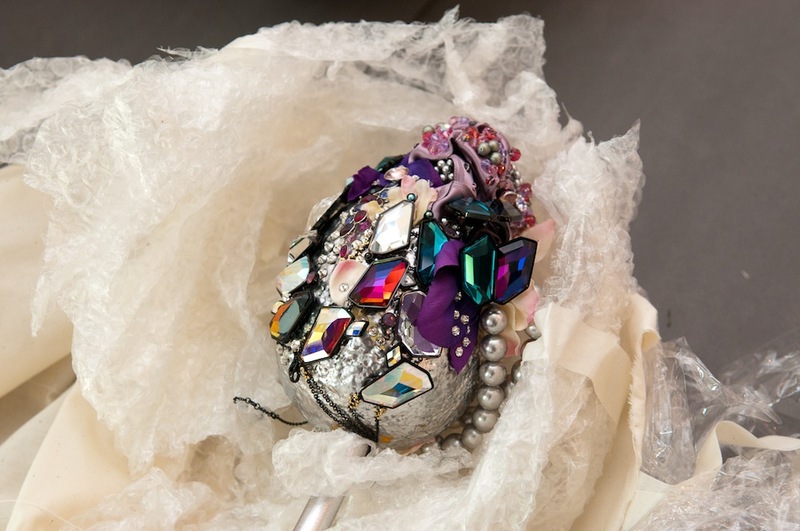 Under the mentorship of the world renowned Nick Cave (who is also chair of SAIC's Fashion Design Department), the students constructed flowers using Swarovksi jewelry, as images to create the fabric and physical pieces for embellishment. To celebrate the window installation, Swarovski hosted an unforgettable in-store event. As if being surrounded by bling isn't enough to get you excited, there were also cocktails, passed hors d'oeuvres and a DJ added to the mix. Fashion, of course, was the topic of discussion throughout the room as Nick Cave and a few of the design students greeted guests and chatted about the upcoming benefit gala and runway show, THE WALK 2012. With every designer from Louboutin to Stuart Weitzman jumping on the metal-cap-toe-pump bandwagon, it was only a matter of time before Zara would create a more affordable version. 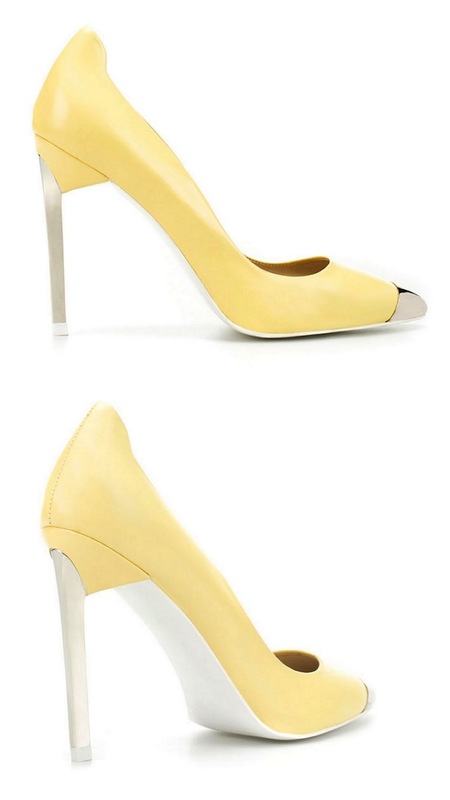 This lemondrop of a pump instantly lifts my spirits and puts me in a cheery mood! It is the perfect color for the upcoming warm weather months and the brush metal heel takes this shoe to a whole new level of fabulousness. If you want to add this shoe to your collection (and who wouldn't? ), pick these up at Zara.com or your local Zara store. And if you are at all familiar with the Zara business model, you know that once these fly off the shelves, they will never be restocked. 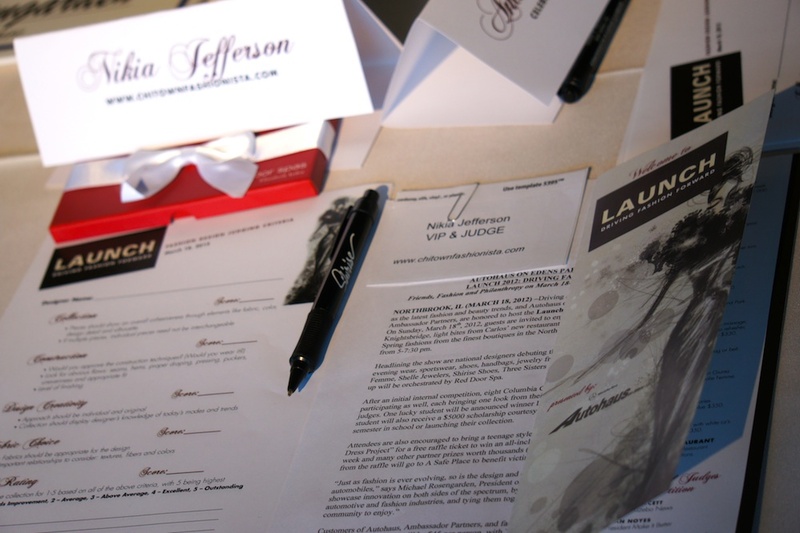 When you receive an invite to a charitable fashion event that includes a runway show featuring local boutiques and student designers at a Mercedes Benz dealership, curiosity alone will have you requesting to be added to the RSVP list. So, when I received a request for attendance to LAUNCH: Driving Fashion Forward, you know exactly what happened. As part of my invite, I was also asked to be a judge for the student designer competition which would award the winning designer with a $5000 scholarship. Needless to say, I was most certainly looking forward to this event. The Autohaus Edens dealership in Northbrook hosted the event. We all know Mercedes Benz vehicles practically sell themselves. But it was the warm personal welcome by the dealership's president, Michael Rosengarden, that impressed me and had me adding Autohaus to my list of best car dealers in the Chicagoland area. While guests shopped local vendors and mingled over cocktails and light bites, I had a chance to meet some of the Columbia College student designers. After finding out that Columbia College's Melissa Gamble was their professor and mentor, I knew these students were quite talented and would present impressive designs on the runway. The North Shore boutiques were the first to be featured. The list of stores included Jolie Femme, Three Sisters, Shirise Shoes, Bett's and Frances Heffernan; all of which provided the audience with some of the best trends for Spring/Summer (eg. peplum, floral, graphic prints and colorblocking).